Today we are interviewing Sir Winston Rutherford Yates, author of The Haunting Of Debishire Manor, a murder, mystery story with a supernatural theme. Everyone is suspect after Sloan found his way home one dark and stormy night, for his grandfathers ninetieth birthday, only to find that he had been murdered by somebody in the manor. His death brings about a series of hauntings exposing deep dark family secrets, and leading Sloan into a love triangle between the woman he loves, and the woman that loves him. A strange caretaker, a massive treasure, a supernatural struggle between good and evil, and the discovery that someone is buried alive in the family graveyard, all add up to a story full of humor, suspense, and terror. This book will take you on a series of turns and twists, while the surprise ending will send chills up and down your spine. Read this book at your own risk, but hurry, for with every second you take, someone is gasping for air beneath a tombstone in the family plot, of Debishire Manor. I was born in a comparatively small setting along with an older sister and a younger brother.‭ My‬ father passed at an early age while my mother passed later in life. I was adopted twice,‭ ‬once by a near relative,‭ ‬who passed a year later,‭ a‬nd the second time by Lady Yates of Monte Vista. Growing up we never had as much as the other kids about the shire,‭ ‬but we did have adventure to keep us busy.‭ ‬And busy we were‭! During my recovery I was to be Knighted on September‭ ‬30th,‭ ‬in the year of our Lord‭ ‬2005,‭ ‬therewith the title,‭ ‬Sir Winston Rutherford Yates‭ ‬. 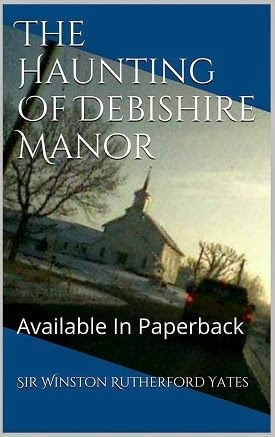 Describe‭ ‬The Haunting of Debishire Manor‭‬ in a few sentences. It is a story about a dysfunctional family living in a manor high atop a hill, that get caught up in the murder of their grandfather. His death brought about a series of haunts and uncovers a family secret that could destroy them all. Who do you think would most appreciate‭ this book? I think it would be appreciated by young to middle aged readers. What inspired you to write a story about a manor with a mysterious,‭ ‬murderous history‭? ‭ I grew up in a haunted house and wanted to tell a little about what I went through in a way that would interest the reader. Who was your favorite character to write in‭ ‬The Haunting of Derbishire Manor‭? Sloan was the character that most suited myself and I put myself into him more, but Nicole was hands down my most favorite character to bring to life. Can you tell us a bit about the creative process for‭ ‬The Haunting of Debishare Manor,‭‬ from the initial idea to the finished book‭? Each book I feel it is important to have an idea where I want to go with my story, but as I create my characters, they take on a life of their own and sometimes that life guides where the story goes. The love relationship of Sloan and Nicole, was one of those such cases. I had not intended for this to have happened, and suddenly, their it was, and they fell in love. In addition to writing fiction,‭ ‬you also write non-fiction.‭ ‬Can you tell us a bit about your non-fiction works‭? ‭ One of my non-fiction books is titled, How to get out of debt, the Christian experience, this book is my personal experience with how God brought me out from under a hundred and fifty-thousand dollars of debt in a very short time, and brought me to being totally debt free for the first time in my life. Do you have a different process for writing‭ ‬non-fiction compared to writing fiction‭? ‭Non-fiction is so much easier to write, especially if it is about something you have lived through, and it takes less creative energy. I don’t really get into non-fiction as deep as fiction, when I write, it’s a totally different animal. How long have you been writing‭? ‭I have been writing for about twenty-five years or so. How do you think you've evolved as a writer since when you first started‭? ‭I think I’ve learned to give my characters stronger personalities, and to add more detail to my characters world. Are there any authors who have influenced your writing style‭? What are your goals as a writer for the next ten years‭? ‭ I have several more projects for the future and I hope to see one of my books translated into a major motion picture someday. Writing can be a difficult,‭ ‬time-consuming pursuit.‭ ‬What motivates you write so prolifically‭? ‭I’m not sure, but sometimes I think you just have to express yourself, and this is my way of doing that. Besides, it’s a real joy. What do you have in mind for your next project‭? ‭I am trying to get my children’s books into print, and maybe finish up the series. Is there anything else you'd like potential readers to know about your book‭? ‭Yes, I think you can write a perfectly good story without the use of profanity, so I do, and I hope you will enjoy my books. Thank you.